Adrian has had a love for playing guitar since the age of 10, regularly playing in bands and school groups all throughout his schooling life. 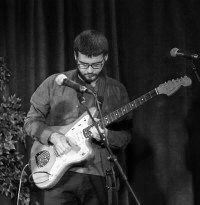 Having initially been influenced by classic rock sounds, he began exploring the sonic possibilities of jazz and experimental rock in his mid-teens, and soaking up as many musical influences as possible. Adrian Verna currently has lesson slots available on Mondays and Tuesdays at High Street Music Preston. Our music lessons service Melbourne’s northern suburbs including Preston, Ivanhoe, Heidelberg, Reservoir, Thornbury, Northcote, Bundoora, Coburg, Bellfield, Kingsbury, Fawkner, Thomastown and Lalor. For bookings and enquiries call us on 03 9077 8343 or fill out our booking form.